Dundonald Street is less than 10 minutes’ walk from George Street and a great location for Fringe and Festival venues. Here you can be assured of a good night’s sleep away from the crowds of the Fringe and city centre traffic. Nearby Broughton Street boasts excellent independent shops, cafes, and restaurants. The Cumberland Bar is also a short distance from the main door, and serves as a lovely local pub with a wonderful area under the willow tree to enjoy the local brew outside. The apartment’s rooms are large, bright and comfortably furnished. All rooms are accessed from the hall. 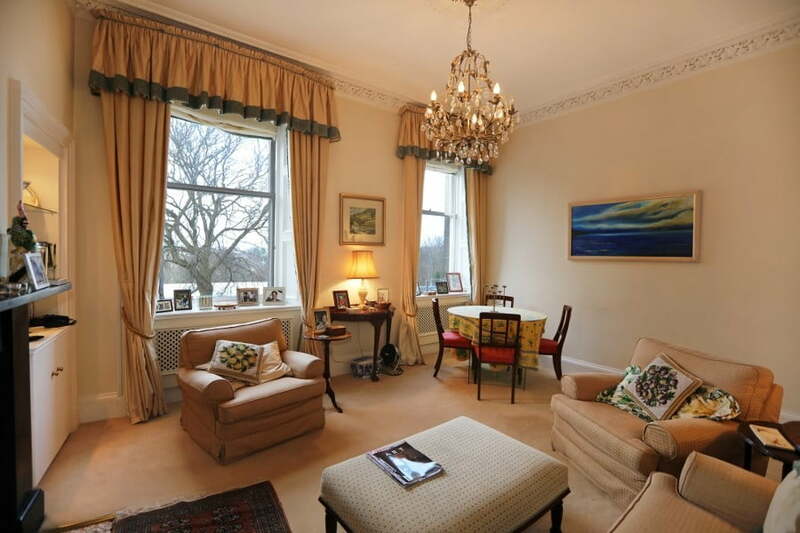 The living room has double windows facing north and a sofa and armchairs to accommodate four or more guests. The dining table by the window also seats four or more. The main bedroom has a kingsize bed and ensuite bathroom with bath, toilet and basin. The main bathroom has the only shower which is over the bath and there is also a basin and toilet here. The second bedroom has two single beds which can be joined to make a super kingsize bed. The room’s large window looks onto Dundonald Street, which has beautiful sandstone buildings typical of New Town Edinburgh properties. The kitchen is well-equipped with pots and pans, crockery and cutlery, a washing machine and a dishwasher. There is also seating here if you don’t wish to use the more formal living room. Tasteful decoration and comfortable furnishings make this a wonderful luxury self-catering apartment in the city for short or longer stays.